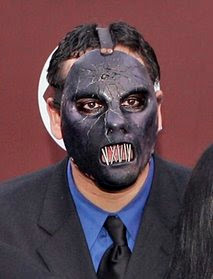 The hotel employee who found Slipknot bassist Paul Gray dead in his room told a 911 operator that there was a hypodermic needle next to Gray's bed and there were "all kinds of pills everywhere." TownePlace Suites maintenance worker Mike Kellow told the operator Monday morning that he found the 38-year-old Gray's body in a corner of his room slumped against a wall. "There's a hypodermic needle next to the bed here," Kellow said. The dispatcher asked if Gray was awake. "Oh God, no. He's all purple," Kellow said. Kellow told the operator it appeared that Gray had been "gone a while." Kellow says he checked on Gray after the bassist's mother called the Urbandale, Iowa, hotel because she couldn't reach her son. The six-minute recording, which was first obtained by Des Moines television station WOI-TV on Wednesday, ends with the dispatcher telling Kellow he was sending a police officer to the hotel.